One seemingly minor change that Google has introduced in the new version of Android, Ice Cream Sandwich, could actually have just as large an impact on the company as the various UI tweaks: anyone who enters their Google account credentials into the phone (which means, just about everyone) will be prompted to sign up for Google+. 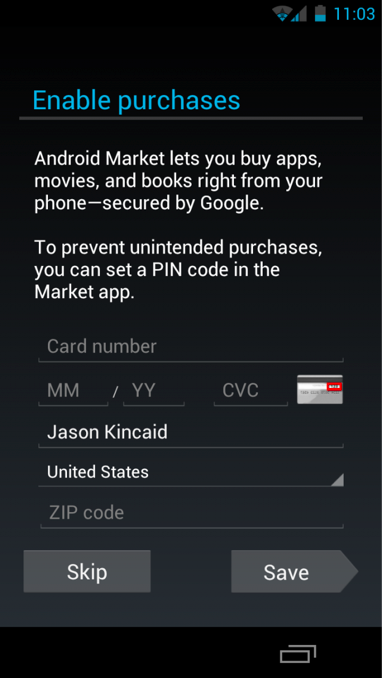 And they’ll also be prompted to enter their credit card information for purchases in Android Market. This is a really big deal. Android is now activating over 550,000 devices per day, and that growth has been increasing steadily. This is going to result in a lot of new Google+ users, or at least people who are signing up for Google+ accounts. And as Google continues to infuse Google+ features into Android, they’ll likely become more and more active on it. The credit card ask is also significant. Android Market has obviously been accepting credit card information for Google Checkout for years now. But I suspect people will be more inclined to enter that information during the initial setup process of their Google accounts, as opposed to the first time when they go to buy a paid app (when they might just shrug their shoulders and find a free alternative). And once Google has your credit card information, it’ll make it that much easier to get users on other premium services, like the Chrome Web Store and Google Wallet.